Whenever Jim Carrey panders to his fans, he goes all out. He has an elastic face, limber body, and a seemingly endless supply of energy to funnel to his brand of physical comedy (How the Grinch Stole Christmas, Me, Myself & Irene). He's not very funny, but people still laugh. Even Carrey realizes that this can only take him so far, so he's tried to branch out into more serious roles (The Majestic, Man on the Moon). However, every time he tries one of these roles, his fans avoid the films like crazy. This forces Carrey to go back to roles that are dumber and more popular with fans, but less satisfying on a longterm level. 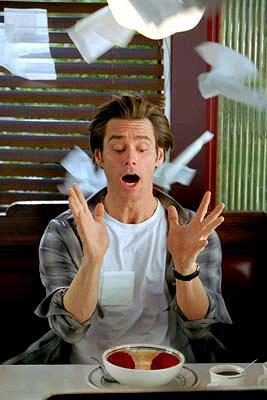 Bruce Almighty is somewhat of a combination of the two roles, fitting a little bit closer to comedic Carrey. Carrey is Bruce Nolan, a television reporter who longs for the anchor job. His talent lies in entertaining the people, so his boss constantly sticks him on little human-interest stories. Bruce longs for more, and constantly complains to his girlfriend Grace (Jennifer Aniston, The Good Girl, Rock Star), so much so that the relationship is in trouble (but he doesn't know this). After a particularly hard day at work, he curses God only to find himself face-to-face with the Creator (Morgan Freeman, Dreamcatcher, Levity). God gives Bruce all his powers, with the only caveat that Bruce cannot infringe upon free will. Although initially skeptical, Bruce eventually believes that he can do pretty much anything he wants. Much of what Carrey fans will appreciate come at this point. Bruce spends his time exacting petty revenge on rivals and doing things for his own benefit. He teaches Grace's dog how to use the toilet, uses the wind to blow up a woman's skirt, parts his tomato soup like the Red Sea, increases Grace's breast size, and other little selfish things. This is classic Carrey, mugging it up for the camera and doing stupid things with his body. Then, Steve Koren (Superstar, A Night at the Roxbury), Mark O'Keefe, and Steve Oedekerk's (Kung Pow: Enter the Fist, Jimmy Neutron: Boy Genius) screenplay takes a turn for the sappy. It seems that being a deity has its responsibilities. Bruce must also answer the prayers of everybody around him. He says yes to all of them, then slowly realizes that he must be diligent in his duties. Saying yes to everybody has consequences that begin to mushroom out of control. 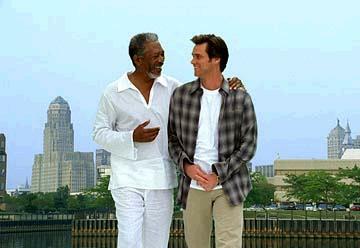 If the first part of Bruce Almighty is a tamer version of older Carrey movies, the last part is just dull. Apparently, director Tom Shadyac (Dragonfly, Patch Adams) felt like instilling some greater sense of purpose into the film. Instead of enjoying it on a superficial level, viewers would now have to think about the film, and upon reflection realize that it's not much of a film at all. Shadyac worked with Carrey in Liar, Liar, before deciding that he belonged working in sentimental drivel. Carrey's comedic talents are wasted since Shadyac never has him go all out, and any opportunity for dramatic talent loses out to a lame script. The biggest disappointment is Aniston, who is coming off a phenomenal performance in The Good Girl. Grace is a step back for her, although the role is much better than the drivel she used to choose. Freeman is the most fun to watch, and he looks like he's having a heck of a time. Unfortunately, his screen time is too limited to make any impact. 1 hour, 36 minutes, Rated PG-13 for language, sexual content, and some crude humor.